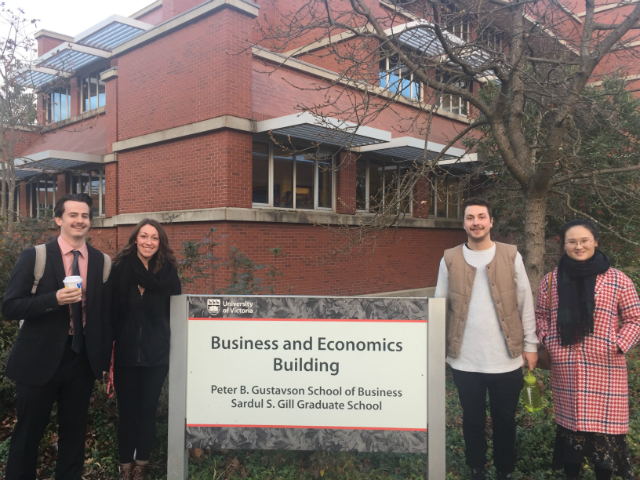 Over the past month, POS-n-go worked with four University of Victoria business students on a marketing analysis and strategy project. The connection enables students to gain valuable work experience while in the classroom. Third year students Cole Slight (l), Amanda Jones, Jack Palmer and Sally Zhao from the Peter B. Gustavson School of Business undertook an analysis of POS-n-go social media marketing along with how business owners make decisions about acquiring a point-of-sale (POS) system, and how to identify and target new businesses needing a POS system. VP Sales and Marketing, Nowell Berg, conducted a remote demo of POS-n-go for the students, outlined the existing sales and marketing strategy and answered a long list of questions from the students. He also provided the students back-ground on the POS and payment terminal industry. We are very pleased to work with higher education and the bright minds entering the workforce of tomorrow. Looking forward to their final report!